E3 is just over 2 weeks away, so it's not long until the next batch of PES 2012 news will hit. PES2012 is so stable right now, from quick FK's to advantage rule, to physicality & collision detection, to brand new reworked ball physics. You'll be happier once E3 hits. New video, new details, new pictures, and gameplay impressions. Got beta testing news. Not going to say anything yet, I hope they announce at E3, but everyone will be buzzing! 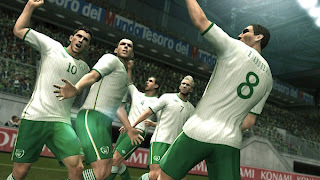 Follow us on Twitter, to keep up-to-date with the latest PES 2012 going-ons. And of course, we'd like to give a big OPE thank you to Adam for the hints.